Last autumn I visited the New York Chinese Scholar’s Garden in Staten Island, located within the large Snug Harbor Cultural Center & Botanical Garden complex with 27 buildings and beautiful grounds. The Scholar’s Garden, which is hidden within the complex, was constructed by 40 Chinese artisans from Suzhou, China, in 1998, and completed within six months. Today, the plants are mature, and while some of the hardscape is in need of repair, that hardly distracts from the beauty of the many layers of architectural details, and textured plantings, including tall stands of bamboo, pine, cherry, plum, set against the contrasting white walls. Every space I moved through was intimate, and because I could always see through an open patterned window or Moon gate to a “borrowed view” there was also a feeling of endless spaciousness. A taste of the garden beyond, becoming part of the composition of the garden I was in, is masterful. The idea of creating infinite space within a limited area is inspiring (photos 1 & 2). Photo2: In the Scholar’s Garden, a “borrowed view’ through a leaky (ie: open pattern) window. In my own Catskills garden I created a series of small enclosed spaces, or garden rooms, and had the chance to play with the idea of borrowed views. In the last of a series of rooms I planted the dark green four-foot tall Rhamnus ‘Fine Line’ hedge that frames the distant view of wildflower meadows and low lying hills. The impact is one of my favorite areas of the garden because it is unexpected (photo 3). Many of our ideas about garden planning, including concealment and surprise, come from the Chinese who believed that it adds mystery if you hide your focal points so that you catch a glimpse here and there. They like to place their main feature, usually a pond, in the center of the garden. Vantage points can be seen from inside the house, or outside on a bridge, in a pavilion, under a covered pathway, or strolling through the garden. Many of these ideas were adopted, first by the Japanese, and then traveled the globe to be translated by a variety of cultures. Each subsequent culture came up with a hybrid version of concealment and surprise that suited its particular culture and climate. 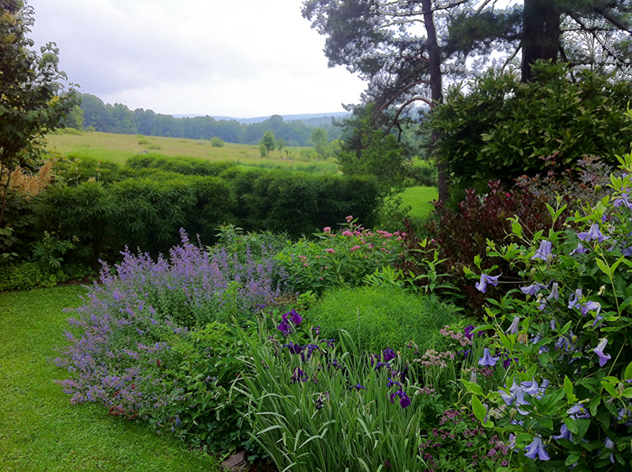 My fellow gardener and friend Mermer Blakslee uses many borrowed views in her wonderful garden. Her husband, Eric, cleared a distant wooded area turning it into meadow, which opened up the view and extended it (photo 4 from porch). 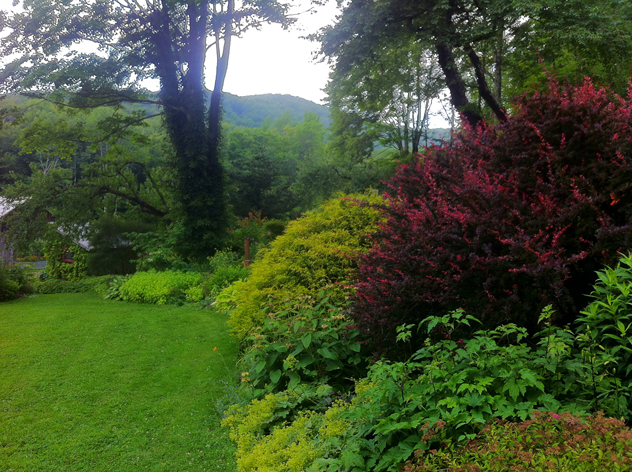 Photo 4: Mermer Blakeslee’s garden with a “borrowed view” from the porch. Mermer’s garden rises up the hill behind her house and the views shift dramatically as you wander back down through the different levels. The whole garden takes on the feeling of a waterfall of textured foliage and flowers cascading down the slope. The house and barns become the adjacent views as you shift vantage points (photo 5). 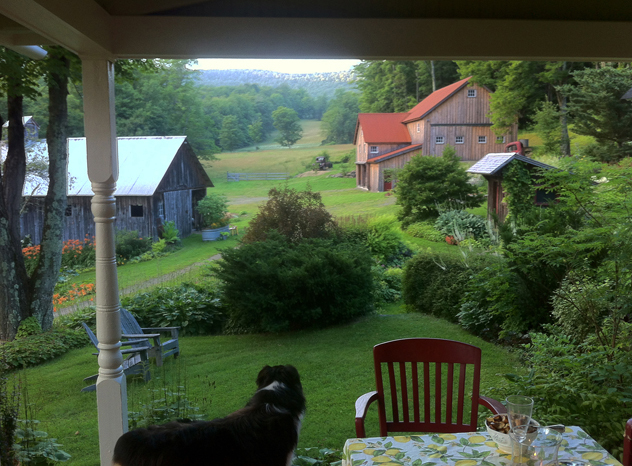 Photo 5: Mermer Blakeslee’s “borrowed adjacent view” of house and outbuildings. Views of distant mountains are framed by tall trees and serve as a backdrop to a shrub border (photo 6). Another gardening friend, Julia Clay, has a small bridge over a stream that was overgrown in brush. 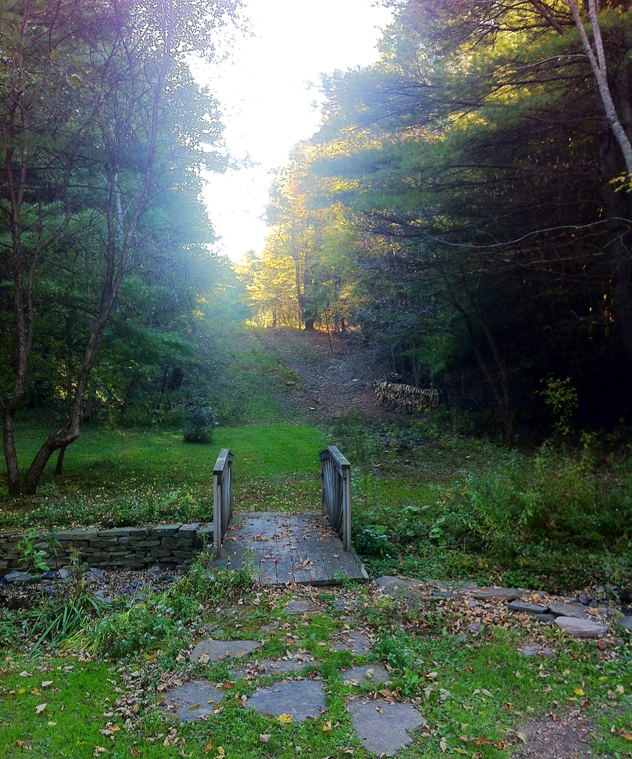 The hill and path beyond the bridge had grown in with dense scrub and she decided to take back the view (photo 7). She hired a couple of helpers to clear the brush and by doing so opened up the view. Now the setting sun lights up the area and brings the whole scene back into the garden composition. The little bridge over the stream makes a nice transition from the tamer to the wilder area of her garden (photo 8). 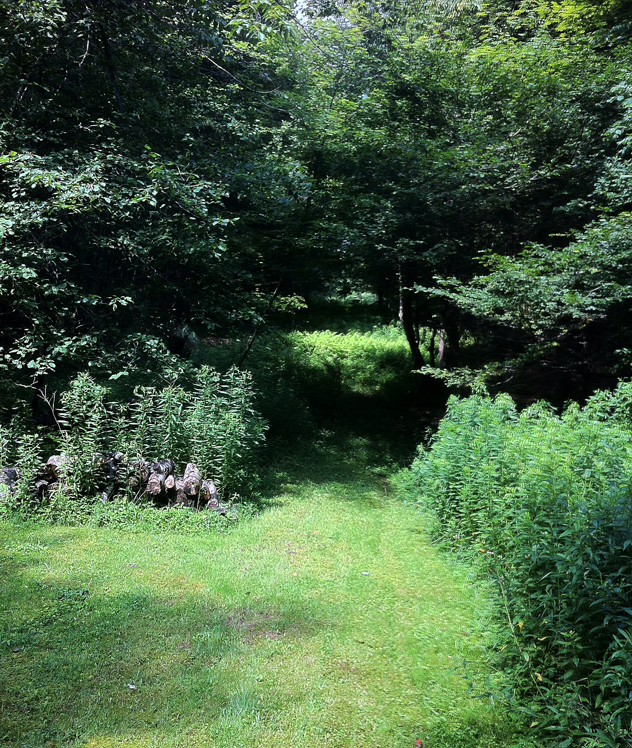 Photo 7: A before view of an overgrown area in Julia Clay’s garden. After 3,000 years of making gardens, the Chinese developed many distinct styles, which include the large estate gardens of the Chinese emperors and members of the Imperial Family, and the more intimate gardens created by scholars, poets, government officials, soldiers, and merchants. The early Scholar’s gardens (700) were located off the library with a sliding door opening onto a garden scene comprised of a walled garden that would not be ventured into but, rather, viewed like a painting. Artfully grouped rocks symbolize the eternal, and were meant to illicit the illusion of mountains. Water symbolizes change, evoking the feeling of a great lake. Rocks and water create harmony in the garden, balancing nature’s yin and yang. These first garden rooms were prototypes of the Scholar’s gardens that evolved over centuries into the high art form of the Ming Dynasty. 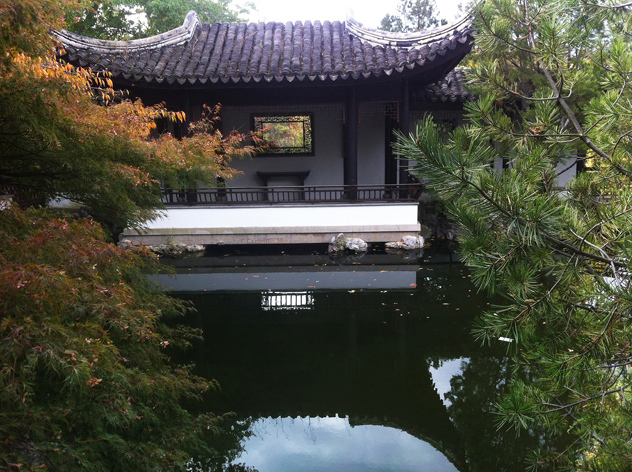 The garden in Staten Island is a copy from a later Ming Scholar’s Garden (1600). The Chinese placed great importance on the idea of place, those specific qualities that make one landscape different from another. Rather than flattening a hill or cutting down a group of trees, they were more likely to enhance the natural features that were present. The emphasis on a connection between house and garden preceded the English Arts and Crafts similar idea by 600 years. The Chinese, unlike Europeans, avoided straight lines, boxy flower borders, and bright colors in the garden, preferring natural curving lines and different green foliage. They took their inspiration from wilder landscapes. All plants were symbolic. Pine trees were indicative of longevity, steadfastness, self-discipline, endurance, and long life. Plum blossom represented strong personality, unafraid of difficulties. Confucianism, Buddhism, Taoism offered people inner peace and harmony and the poets and scholars chose architectural details and plants for their symbolic meaning. 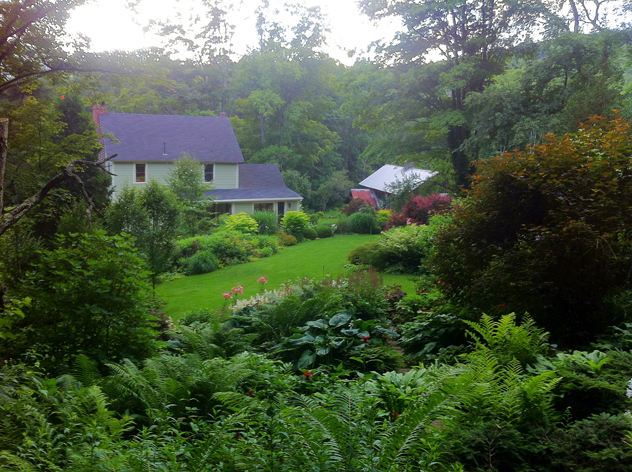 Retreating from the chaos of the world they sought to apply these transcendent principles to their gardens (photo 9). 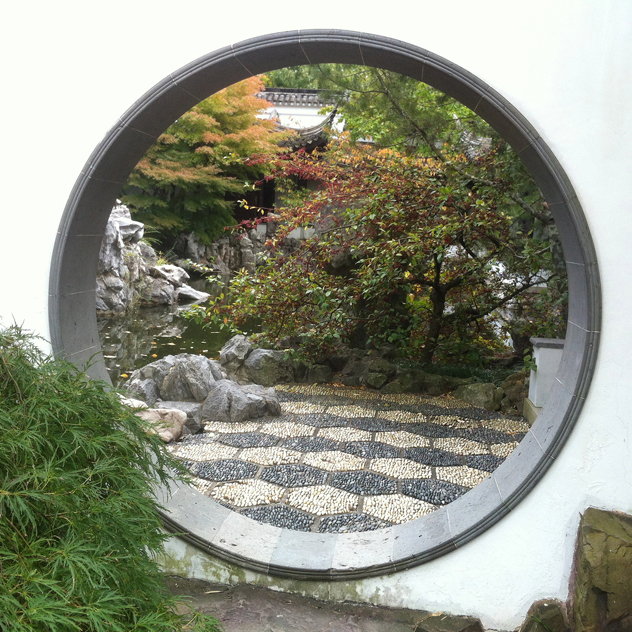 Another structural device used in Chinese gardens is the circle symbolizing togetherness, depicted in Moon gates and round tables placed within square backgrounds. The Moon gate and gourd-shaped gates make the viewer pause for a transition before moving into a new space. Paths in Chinese gardens often zigzag, which represent the passages of a human life. Not having had the opportunity to travel to China to see firsthand many of their wonderful gardens it was, however, a treat to experience an example of one of China’s great contributions to the world and to see how we can utilize some of those ideas today in our own gardens. 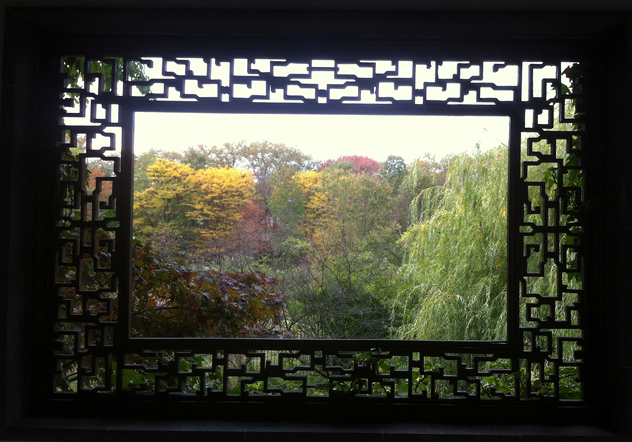 Photo 9: Chinese open (“leaky”) window in the Scholar’s Garden in Staten Island.